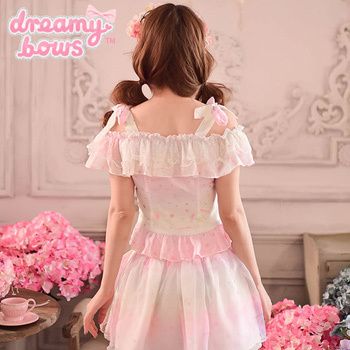 This beautiful fairy-like pastel coloured top from independent clothing brand Candy Rain is full of delicate details, and is perfect for larme kei, mahou kei and other cute J-fashion styles. The top has a stunning off-the-shoulder design with a big ruffle accented with polka dot organza fabric, and there are additional knot-tie straps to stop the top falling down. The main fabric is light and floaty sweet motifs and the text "Love Soda" printed on, in subtle yet colourful hues of pink and mint.